PLYMOUTH, MASS. — There’s Americana Week, Antiques Week, Asian Week, and then there’s Decoy Week. Steve O’Brien’s Copley Fine Art Auctions got Decoy Week off to a strong start, sending $1.6 million worth of decoys and related items to new homes. Steve O’Brien smiles as he holds the preening black duck made by Elmer Crowell. He predicted it would be the feature decoy of the auction and he was right. It earned $210,000 from dealer Russ Goldberger, bidding for a client. The sale was conducted in Plymouth on July 25 and included 532 lots of decoys and other sporting material. It wasn’t just an auction — it was an event. The day before the show, O’Brien arranged a demonstration of decoy carving by Mark McNair, a well-known carver from Craddockville, Va. McNair and his two sons, who also carve, exhibited and sold several of their recent works. O’Brien also hosted a meeting of collectors and dealers interested in reconstituting the dormant New England Decoy Collectors Association. In addition, there was a decoy show with several dealers set up adjacent to the auction room, displaying hundreds more decoys for sale. The salesroom was packed when the auction began, several phone lines were in use and Internet bidding was available on Bidsquare. The sale was 85 percent sold by lot and more than 94 percent by value. Auctioneer Peter Coccoluto ran a smooth, rapid sale. During the preview, Steve O’Brien told Antiques and The Arts Weekly that he anticipated that Elmer Crowell’s preening black duck would be the star of the sale, and he was right. The decoy sold in the room for $210,000 to well-known dealer Russ Goldberger, bidding for a client. The full-bodied black duck was an early, pre-brand decoy in exceptional condition. Black ducks were, according to the catalog, Crowell’s most requested species and he carved hundreds in the straight head position. According to O’Brien, only six are known in the preening position and this was one of the best. From the Adele Earnest collection came this running sickle-billed curlew. The iconic folk sculpture was described in Earnest’s 1965 book Art of the Decoy and illustrated in her 1984 book Folk Art in America. It doubled its high estimate, going out at $36,000. A similar bird was illustrated on the cover of The Magazine Antiques in September 1989 and in Adele Earnest’s 1965 book, The Art of The Decoy: American Bird Carvings. Goldberger said that he had very carefully examined the decoy in bright sunlight and with black light. He also examined the x-rays that O’Brien had made available. Goldberger agreed that the condition was exceptional, and advised his client accordingly. The black duck was not the only Crowell creation to do well. 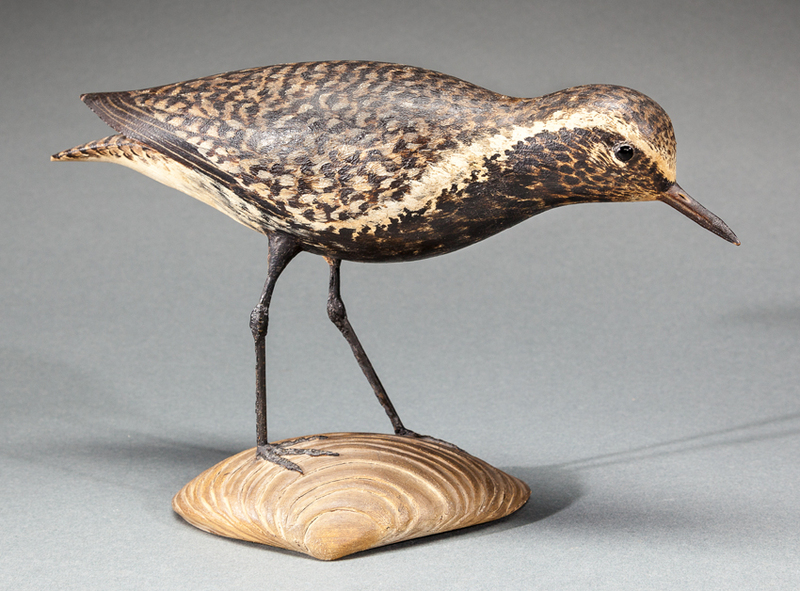 A life-size running black-bellied plover, circa 1912, exceeded its $50,000 estimate, selling for $78,000, and a life-size circa 1930 semiplated plover went out for $22,800, also over its estimate, to a phone bidder. There were 22 miniatures by Crowell and all sold over their high estimates. The songbirds did well, with a miniature cedar waxwing bringing $2,040 and a miniature goldfinch bringing $1,800. Elmer Crowell’s life-size running black bellied plover came from the well-known collection of Russell B. Aiken. It was cataloged as being one of the best-painted plovers Crowell ever made, in addition to being well detailed. It fetched $78,000. Crowell’s ducks were more popular than the songbirds Setting a new world’s record for a miniature waterfowl carving was an extremely rare turned head preening pintail drake. Crowell made very few preening miniatures and this one far exceeded its estimate, finishing up at $28,800. A miniature canvasback hen, with the Crowell mark, earned $5,400, and a miniature green heron ended up at $5,100. Each selling for $2,760 were a long-tailed duck drake and a Wilson’s, or common, tern. As with several of the miniatures in this sale, these birds had been purchased directly from Crowell by an early member of the consignor’s family. Multiple phone bidders competed with bidders in the room and on the Internet for the miniatures. O’Brien said that he thought at least two of the miniatures had been good buys. A mallard drake and a wood duck were among the smallest carvings that Crowell ever produced, at just 1 7/8 inches tall. The mallard achieved $1,020, and the wood duck made $1,560. There were several birds that made their new owners happy, selling well below their high estimates. Very few lots at a Copley sale have reserves, and almost none estimated below $5,000 have reserves. Birds are there to sell and bargains can be had. Nathan Cobb Jr’s feeding brant was passed during the auction but sold a few minutes later for $44,000. Dating to about 1880, it was made on Cobb Island, Va. It has a “root head,” likely made from a single twisted branch of myrtle, which is abundant of the island. In original paint, it bore the brand of Cobb’s son. The sale included two important Cobb Island decoys carved by Nathan Cobb Jr, circa 1880. Both were passed during the auction but sold a few minutes later. Each brought $52,800. Cobb’s feeding brant has two “E’s” branded into its base, indicating that it had belonged to the gunning rig used by Cobb’s son, Elkanah, who was also a guide and hunter. Colin McNair, Copley’s decoy specialist, told Antiques and The Arts Weekly that this decoy has a very unusual “root head” in an animated feeding position. It’s a feature not often found in Southern decoys. It was, according to McNair, probably carved from a single twisted branch of wax myrtle, which is abundant on the island. Cobb’s brants are especially life-like, as he was known to have a flock of tame brants on the island. The importance of this particular decoy has been recognized for many years. It was illustrated in a collection of essays in Duck Shooting Along The Atlantic Tidewater, published in 1947. McNair said that the second important Cobb in the sale was a running curlew. Curlews by Cobb are uncommon and this one had original paint and a well-respected provenance, having been in the William Mackey Jr collection. O’Brien said that he was pleasantly surprised at the interest in two decoys by Charles Hart, a Gloucester carver. Both doubled their high estimates. One was a black duck with a hollowed out body and original paint. It had no bottom board and was designed to create a suction on calm days. It finished at $12,000. A swimming black duck by Hart of hollow construction and branded by the maker went out at $5,400. Also doing well was a canvas covered Canada goose made by George Boyd. It had been purchased in 1923 by future General George S. Patton. Patton gave it to his cousin, Gus Means, and the decoy bears the brand used by Means. It made $16,800. Speaking of Canada geese, three miniature goose carvings by Joseph Lincoln sold between $3,300 and $4,500. The lowest priced of the three showed a little more wear to the paint than the others. More than doubling the high estimate, Ira Hudson’s circa 1930 pintail drake had been in the collection of William H. Purnell Jr. Hudson worked in Chincoteague, Va., and his mark was on the bottom of the decoy. It brought $38,400. With a strong folk art provenance was a sickle-billed curlew that had belonged to Adele Earnest. She discussed it in her 1965 book Art of the Decoy: American Bird Carvings and pictured it in her 1984 book Folk Art in America. It was also discussed in Spiritually Moving, A Collection of American Folk Art Sculpture. Several phone bidders competed for this bird, with the winning bidder paying $36,000. A large preening eider hen made by Gus Wilson of South Portland, Maine, circa 1900, went for $18,000. Although perhaps best known as a decoy carver, Wilson was also a boat builder, outdoorsman and lighthouse keeper. His work as lighthouse keeper provided a steady income and time for him to pursue his other interests. Also exceeding high estimates were a life-size trumpeter swan decoy, which fetched $1,920, and a long-tailed duck drake made by Lemuel Ward of Crisfield, Md., which went out at $11,400. A fine pintail drake by Ira Hudson more than doubled its high estimate, bringing $38,400. A premier-grade Mason canvasback drake sold well over its estimate, going out at $7,200. The sale included several watercolors by Ogden M. Pleissner (1905–1983). 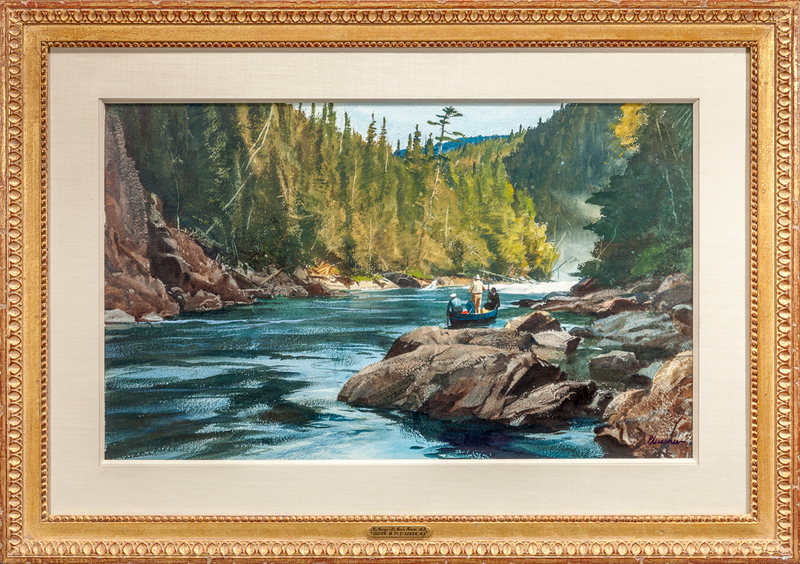 Titled “The Gorge-Salmon Fishing,” this one brought $30,000. Copley sales usually include a good selection of original art work with sporting themes. “The Gorge-Salmon Fishing,” a watercolor by Ogden M. Pleissner (1905-1983), sold within its estimates, finishing at $30,000. 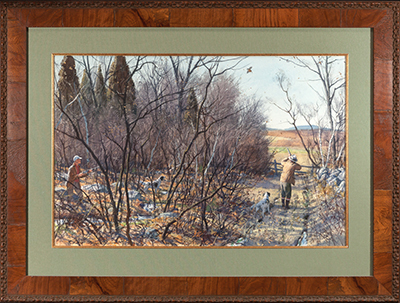 “Woodcock Hunting,” a watercolor by Aiden Lassell Ripley (1896–1969), went out at $24,000. Two other watercolors by Ripley each brought just under $10,000 each, and a charcoal by the artist achieved $900. The fine arts category was led by an Arthur Burdett Frost (1851–1928) watercolor scene titled “English Snipe.” It pictured a hunter over two pointers and finished up at $48,000. O’Brien commented that several paintings sold for five figures and only one estimated in that range failed to sell. When McNair demonstrated his approach to carving decoys, he told the assembled crowd that one of his most useful tools was a small axe, or hatchet, which he used for roughing out the form of the decoy. Both of McNair’s sons, Colin and Ian, are also actively carving today. Each member of the family displayed his work and several pieces sold. A whale by Mark sold, a large blue-fin tuna by Colin sold for $3,500, and shorebirds by Ian also sold. Colin told Antiques and The Arts Weekly that his tuna was made from a 3-inch white cedar board, with the fins inlaid. When asked about how long it took him to paint this large fish, he answered, “If I make a good carving, painting should be easy.” No way to get him to commit as to how much labor was involved. He also said that he sold his first carving when he was six years old. Several carvings by Mark McNair were sold in the auction, with an exceptional white whale, 50 inches long, bringing $8,610. Other McNair carvings sold well. In the late 1970s, Dr George Starr, one of the most respected collectors of his day, was instrumental in the formation of the New England Decoy Collectors Association. At its height, it had about 175 members. When Starr died in the 1980s, the organization faded away. Jim Parker, Copley’s decoy consultant, convened a meeting of interested collectors and dealers in a meeting room at the hotel. It was attended by about 40 people, and there was widespread interest in getting a new group organized, using the same name as the original. Parker told Antiques and The Arts Weekly that he hopes to generate enough interest to produce a decoy show in New England and publish an informative newsletter. Prices reported include buyer’s premium. For information, www.copleyart.com or 617-536-0030. 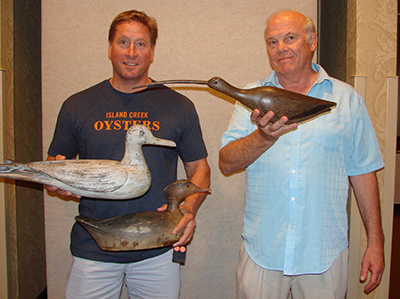 PORTSMOUTH, N.H. — Prices were strong at Guyette & Deeter’s July 28–29 decoy auction. The sale grossed $2.4 million and was more than 96 percent sold by lot. A number of very folky birds did well, and an outstanding decoy from the Stewart Gregory collection was the star of the sale, bringing $258,750. The market for Elmer Crowell decoys and miniatures was strong as well, and there were a number of birds with impeccable provenance, having been owned by renowned collectors, such as George Starr, Dr Lloyd Griffith and Bill Mackey. Gary Guyette and Jon Deeter with the top lot of the day, the Thomas Gelston running curlew that had belonged to Stewart Gregory. It sold in the room for $258,750. Jon is holding the confidence gull that brought $48,775 and the Charles Osgood hollow-carved merganser hen that took $89,125. The two-day sale comprised 639 lots, and in addition to the decoys, included ammunition advertising, shotshell boxes, duck calls and more. Guyette’s catalog descriptions are fully guaranteed. Jim Julia conducted the auction for the St Michaels, Md.-based firm, and no one ever falls asleep when he is at the podium. He entertains with a seemingly endless supply of jokes and Down-East anecdotes. Numerous phone lines were in use and Internet bidding was available. Stewart Gregory was not known primarily as a decoy collector, and when his folk art collection was sold by Sotheby Parke-Bernet, the decoys were not included. Richard Bourne, Hyannis, Mass., sold the decoys in July 1978. 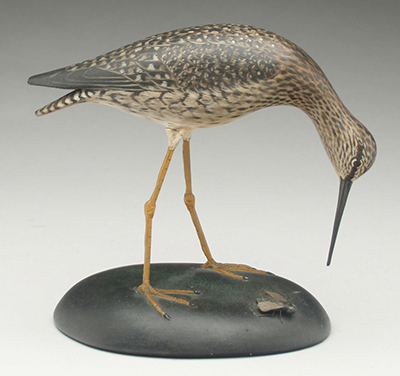 One of the birds in that sale was a running curlew decoy, made by Thomas Gelston, who worked in Quogue, N.Y. The curlew sold then for $9,000, just under what was then the world’s record price for a decoy, $10,500. This decoy was included in Gregory’s exhibition “An Eye On America” at the Museum of American Folk Art in 1972. In this most recent auction, it was bought in the room by Cap Vinal, a well-known collector from Duxbury, Mass. Vinal, author of a book on carver Joe Lincoln, told Antiques and The Arts Weekly that he thought this decoy “was a great bird and they don’t come along very often.” He paid $258,750 for it. He said that he has been collecting decoys for about 40 years and remembers paying $10 for his first decoy at a Bourne auction. The star of the sale was this running curlew that had been owned by Stewart Gregory. It was made by Long island carver Thomas Gelston and sold for $258,750. Other decoys with a particularly pronounced folk art feeling also brought strong prices. A confidence gull decoy from Eastern Long Island in original paint with a weathered surface brought $48,875. The bird was about 23 inches long with deep relief carving and carved crossed wingtips. It was from the collection of George Ross Starr and is illustrated on the dust jacket of his book Decoys of the Atlantic Flyway. Another gull from Long Island, with carved and crossed wingtips, brought $9,775. 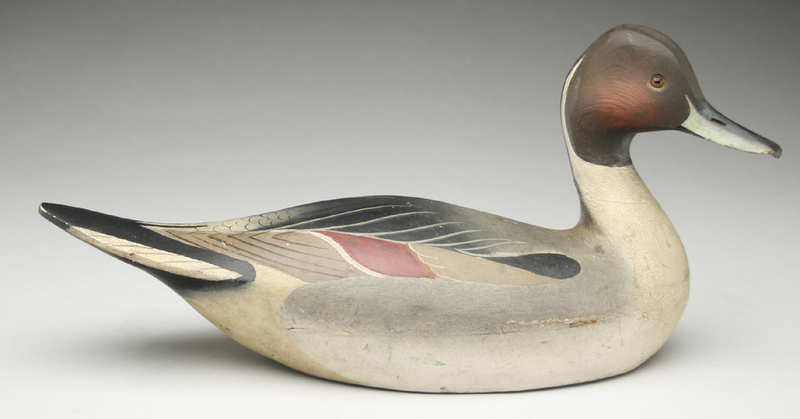 A small brant decoy made by George Asa Miller, East Hampton, N.Y., went out at $12,075. It, too, had original paint with moderate wear, giving it a very attractive surface. One-of-a-kind full-size feeding yellowlegs by Elmer Crowell sold for $103,500. Note the carved fly at the bird’s feet. Crowell decoys and decorative carving did very well at this sale. Decoys and miniatures by Elmer Crowell continued to generate interest from multiple bidders and bring strong prices. The top Crowell lot was a one-of-a-kind full-size feeding yellowlegs with a carved fly at its feet. It had fine paint detail and was illustrated in Brian Cullity’s< The Songless Aviary. Its final price was $103,500. A brant decoy with detailed original paint finished at $16,100. It had a slightly turned head and painted crossed wingtips and the maker’s oval mark. There were two rare pairs of golden plover silhouettes. One earned $10,063, while the other went to the same buyer for $5,750. A pintail hen with well-blended feather paint, also with the oval mark, ended up at $11,500, while a rare double mount miniature pair of wood ducks achieved $6,038. Russ Goldberger, a New Hampshire decoy dealer who specializes in Crowell miniatures, explained that the earliest Crowell miniatures were unmarked. Around 1915, an oval mark was stamped into the base. Around 1928, when Crowell’s son Cleon joined his father, a rectangular mark was used. He said that Crowell made about 60 different songbird miniatures, many were special orders and some are quite rare. Goldberger also pointed out that as Crowell aged, there was somewhat of a decrease in the quality of his workmanship. Collector Don Kirson, from Glydon, Md., was the high bidder on an important hollow-carved merganser hen made by Charles Osgood of Salem, Mass., in the third quarter of the Nineteenth Century. The decoy had also been in the Starr collection and had an upswept tail and lifted head. Kirson paid $89,125 for the decoy with original paint. He told Antiques and The Arts Weekly, “It has great form, great surface, and I love it,” He explained that his collection does not necessarily focus on a particular carver or region, but that he tries to buy only outstanding examples of the work of well-respected carvers. One of two decoys made by Minnesota carver John Tax. The feeding Canada goose brought $86,250. Two decoys made by John Tax, Osakis, Minn., did quite well. A feeding Canada goose field decoy with thick original paint and little wear fetched $86,250, and another Canada goose, this one hollow carved and laminated, finished at $46,000. Selling well over its estimate was a hollow-carved goldeneye drake made by Albert Laing of Stratford, Conn., in the third quarter of the Nineteenth Century. It was a rare “tucked head”-style bird with an ice groove and a unique bill indentation. It brought $28,750 from a phone bidder. Finishing slightly over its estimate was another New England decoy made by Orlando Sylvester Bibber from Maine. His classic merganser drake with a slightly turned head and slightly pointed tail ended up at $29,900. Decoys and decorative carvings by the Ward brothers are always popular. A large wall plaque presented by the brothers to Maryland Governor Theodore McKeldin in 1956 went out for $31,625. It had a pair of flying pintails with turned heads mounted. A pair of preening canvasbacks by the brothers achieved $18,400. 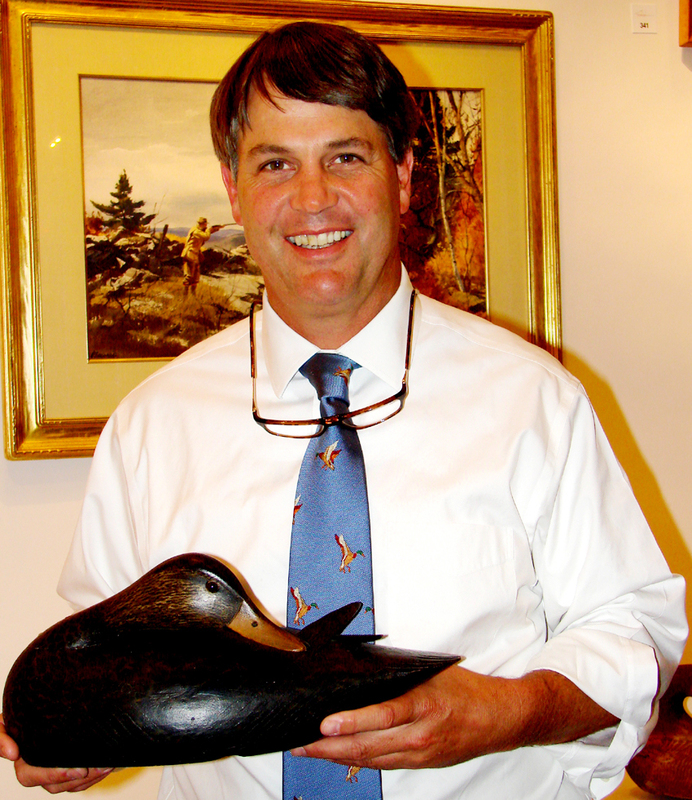 A pintail drake by the Ward Brothers of Maryland achieved $69,000. It was one of several works by the brothers. Goldberger, who wrote the book on Masons along with Alan Haid, was asked about Mason decoys. The auction catalogs list Masons in three grades: Standard, Challenge and Premier. Goldberger said that in 1910 a standard-grade decoy might have sold for 50 cents, a challenge-grade decoy would have been 75 cents and a premier-grade decoy would have cost about $1. For every 100 standard grade decoys there would have been about ten challenge grade and only two premier grade. A premier-grade Canada goose with loop feather paint detail brought $34,500, while a premier-grade goldeneye hen with “snakey head” ended up at $11,500. A challenge-grade bluebill drake with original paint and minor discoloration sold for $690. A 4-foot display model of an Old Town canoe made in the early Twentieth Century achieved $27,600. It is estimated that fewer than 300 models were made. Related items drew a lot of interest. An Old Town Canoe Company 4-foot display model sold for $27,600. Constructed to the same high standards as the full size canoes, these models are highly sought after. Roger Young, a dealer from Keene, N.H., was set up at the show that accompanied the auction. He deals with canoe models and has researched the Old Town display models. He estimates that not more than 300 were produced. He had one for sale, priced at $25,000. Several duck calls were sold along with ammunition advertising and shotshell boxes. 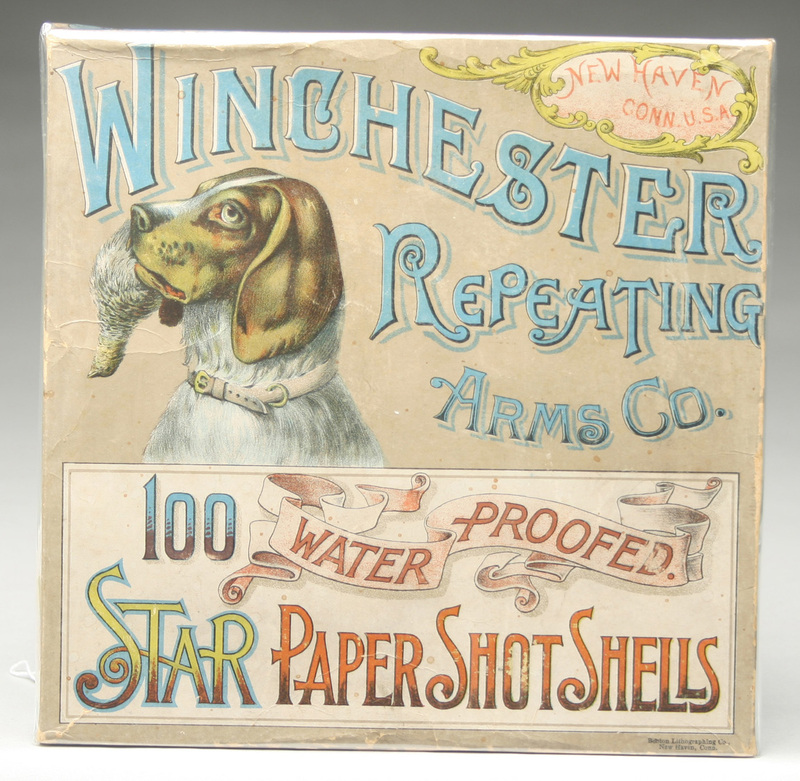 Described in the catalog as the rarest of shotgun shell boxes, a Winchester Star 100-count Christmas shell box, produced by the Winchester Repeating Arms Co., sold for $16,675. It is one of only two known examples. A Union Metallic Cartridge Company, 100-count Christmas shotgun shell box brought $3,738. The book on shotgun shell boxes states that this is the rarest box, with only two examples known. It had been in the McCleery collection and its final price was $16,675. One cannot finish a review of this auction without mentioning the way Guyette & Deeter take care of their customers. Cocktails and snacks were provided during the Monday evening preview and excellent lunches were provided both days of the auctions. Numerous compliments were heard. For additional information, www.guyetteanddeeter.com or 410-745-0485.